There were few foods on my list of “untried” things and oxtail was one of them. 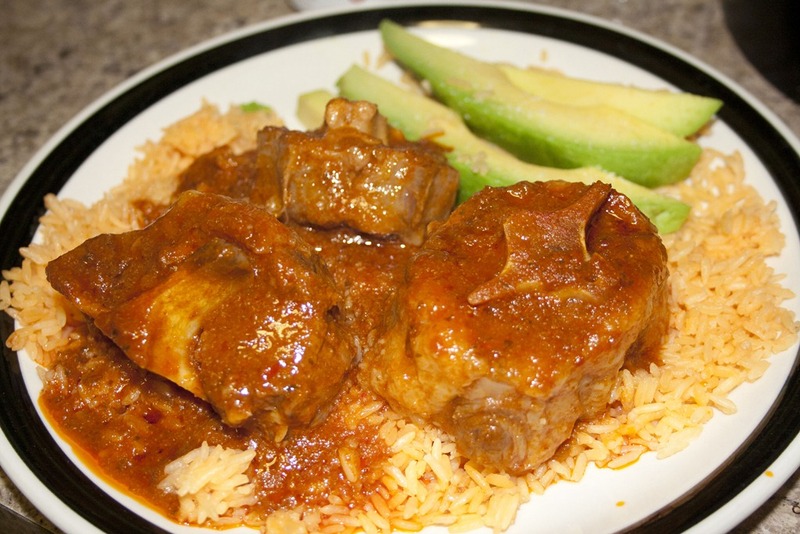 Growing up in a predominantly Hispanic neighborhood, I often heard of the wonderfulness of oxtail but I just never really had the inclination to go and try it. When BR and I started dating, he asked if I knew any places to get oxtail. And I didn’t. It’s one of his favorite dishes. We searched the net for possible places in Williamsburg but found none close by. The nagging craving he had for oxtail lasted weeks. When we found ourselves back in my old stomping grounds of Kew Gardens for an emergency vet visit (Mickey is all better now!) we found ourselves within walking distance of some highly rated Caribbean restaurants. There was no time like the present to take a long walk and get my very first oxtail. The place was nothing fancy but the fragrant, tender, and delicious dish was enough to make me fall in love with oxtail. Traveling to Ozone Park just for oxtail seemed a little ridiculous. And loving it as much as we did, I thought it was time for me to attempt to make my own. My only drawback on oxtail is the price. Back when I was growing up, it wasn’t considered a high quality dish. It was popular with low income families because it was so inexpensive. But, today, at $17 a pound, it looks like oxtail has won the hearts of many rich people. I bit the bullet and made the purchase. $21 later, we had our own oxtail. Since I never made it before and knew that it was a type of meat that required stewing, I stewed it the only way I knew how: Puerto Rican Style. 1. In a dutch oven or a large heavy bottom pot, heat the oil over a medium flame. Add the sofrito to the pot and allow to heat until fragrant (about 30 seconds). 2. 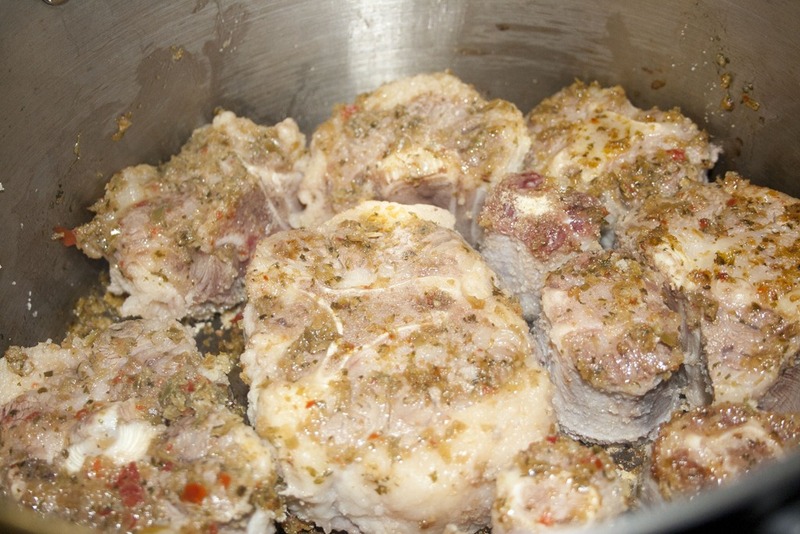 Place the oxtail in the pot and sear for 3 minutes on each side. 3. Add salt, garlic and onion powder to the meat. Once both sides are seared and spices added, pour in the entire contents of the tomato sauce. 4. Depending on how much room is left in the pan, add 2 cups of water. You want the water to just cover the oxtail. Add more or less to just cover the meat. Raise the flame to bring the sauce to a slow boil, cover, and lower flame to lowest setting. 5. Taste sauce. It’s a good time to add more salt if its bland or more water if its too salty. 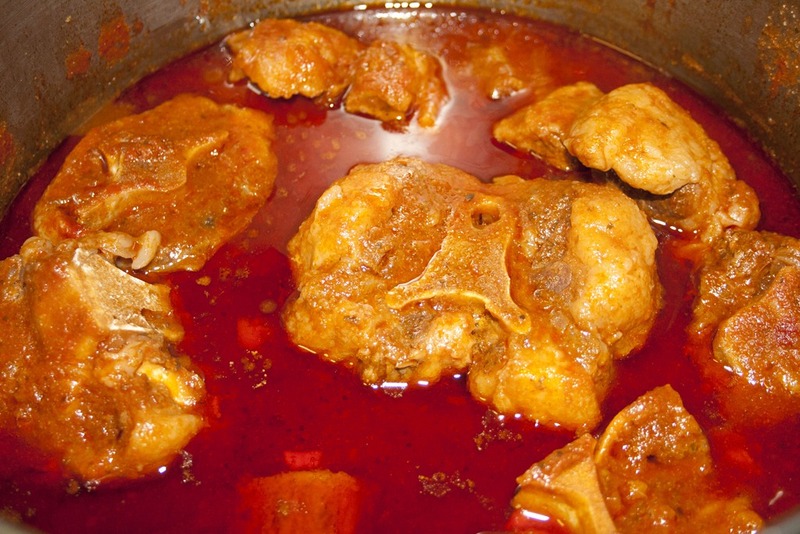 Allow to simmer on low or 2.5 – 3 hrs. *if you wanted to make this in the slow cooker, simply follow steps 1-4 and transfer to a 5-6 qt slow cooker. Cook on high 2-4 hrs or 4-8 hrs. the longer it cooks, the more tender the meat! 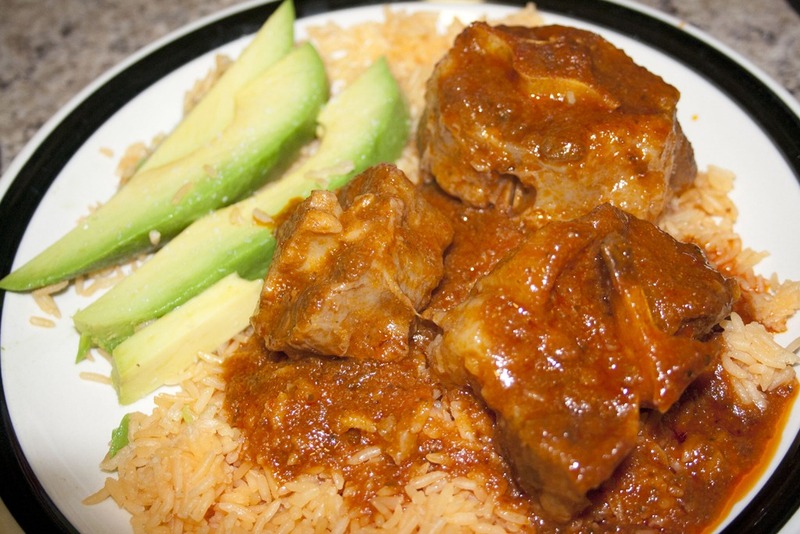 The slow simmering of the oxtail yields a succulent and tender meat. BR was tortured the entire 3 hrs that it cooked. It smells wonderful. I served this over yellow rice with slices of avocado sprinkled with sea salt. Considering that this was my very first time making oxtail, I think it came out sublimely well! The aromas are fantastic. The flavor is rich and meaty. And according to BR, I have ruined all other oxtails. I’d say that’s a success. Be warned. This can be a little bit messy. Don’t be afraid to roll up your sleeves and eat with your hands! You are just too good a cook to waste it away on BR! Open your own biz!